What you need to know about NESHAP requirements before you buy your spray booth. Do you remember that movie, based on a true story, Erin Brockovich? Julie Roberts won an Oscar for her portrayal of the real-life environmentalist that went after a power company in Texas after contaminating the drinking water and caused many health issues in the community? That’s what I think of when I think of the National Emission Standards for Hazardous Air Pollutants (NESHAP). The goal is to reduce hazardous air pollutants (HAPs), which are pollutants that are known or suspected to cause cancer or other serious health effects, such as reproductive effects or birth defects. HAPs are also known to cause adverse environmental effects. Americans are breathing easier and living healthier lives since the Clean Air Act was enacted in 1970. The EPA has made the reduction of HAPs a priority since the Clean Air Act Amendments of 1990. It’s important if you are working with these pollutants, you follow the rules of compliance for working safely. The National Emission Standards for Hazardous Air Pollutants (NESHAP) were developed in the 1970 (Clean Air Act – CAA) for hazardous air pollutants and revisited / enforced in the Clean Air Act Amendments of 1990. First & Before: If you are looking to buy a booth, we always recommend that you speak with your local officials first to find out what is required. You’ll thank us later when you’re not paying to “get compliant”. This will vary based on where you are, what your spraying, etc. Your fire marshal can give you the city’s requirements, like if your booth needs to be ETL-listed (which we have), but you should also contact your local EPA office to see if you will be required to meet NESHAP requirements as well. It’s a good idea to have all your permits in place before you buy your booth. 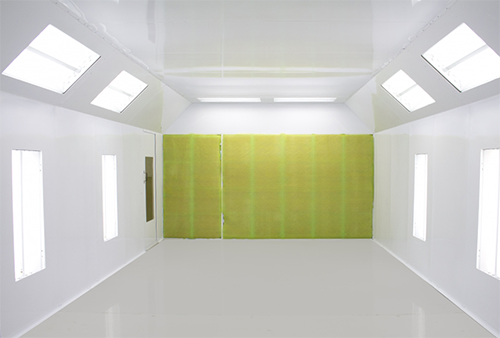 Read our blog to see all Top 10 Things you need to consider before buying a paint booth. Know what you’re spraying. Do you know what you’re spraying? Have you read the labels and made yourself familiar with what all those ingredients are? Do you have the proper protective gear and equipment for you and your staff, to protect their health and safety? 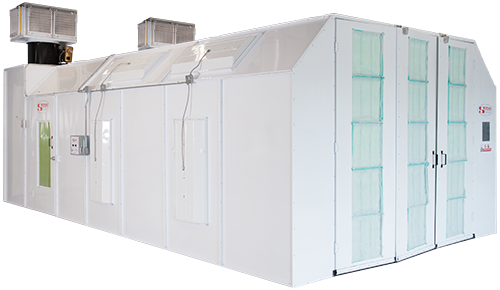 Spray booths used to refinish complete motor vehicles or mobile equipment must be fully enclosed and ventilated at negative pressure or up to 0.05 inches water gauge positive pressure for booths that have seals on all doors and other openings and an automatic pressure balancing system. Spray booths used to coat miscellaneous parts or products or vehicle sub-assemblies must have a full roof, at least three complete walls or side curtains, and ventilated so that air is drawn into the booth. Spray-applied coatings must be applied with a high-volume, low pressure (HVLP) spray gun, electrostatic application, airless or air-assisted airless spray gun, or an equivalent technology. Train and certify all personnel who spray apply surface coatings no later than 180 days after hiring. Install/operate filter technologies on all spray booths to achieve at least 98% capture efficiency. NESHAP sanding booth with two MERV 11 filter boxes for recirculated air. That last one, about the correct filtration, can be a bit tricky to understand if you’re not a “filter expert”. So, we consulted our filter experts about it and came up with the solution. We can now provide you with a booth that has been designed for three- or two-stage NESHAP filtration. If it is two-stage, it means that your overspray will pass through 2 different filters before it is exhausted. If it is three-stage filtration, it will go through… you guessed it, three different filters. This is to ensure that the air is properly filtered of all contaminates before exhausted. The booth will have a larger-than-normal fan to pull the air through multiple filters and there will be a “set” of different types of filters, based on your needs for compliance. The blanket filter pads, pocket filters, MERV 11 Filters and more are stacked to fit you needs. We choose filters with the efficiency you need to meet the 98% capture requirement. We’re here to help you figure it out and get you setup to be successful, compliant, and safe. We don’t want Erin Brockovich coming after you next. Give us a call. Previous Previous post: NEW! Heated Full Downdraft Booth.